How do you score new clothes without opening your wallet? At the HUG Spring Cleaning Fashion Swap, of course! This all-you-can-swap event brought fifty five hip + urban girls out of hibernation and gave old outfits a chance of finding new homes. Wendy, Lisa J, Tamika and Daniela from HUG is all ready to swap till they drop! 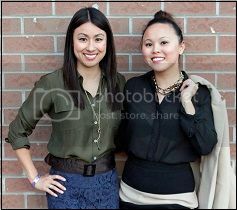 Kristy and Lisa, our beautiful co-hosts and founders of Rent Frock Repeat. Great networking, fashion and Fruli! Thanks to our beverage sponsor for providing the tasty Belgian strawberry wheat beer! One person's discard is another one's treasure and many of us walked away with a new outfit or three.